Kyra Gracie adjusts a choke on Malvino Salvador. 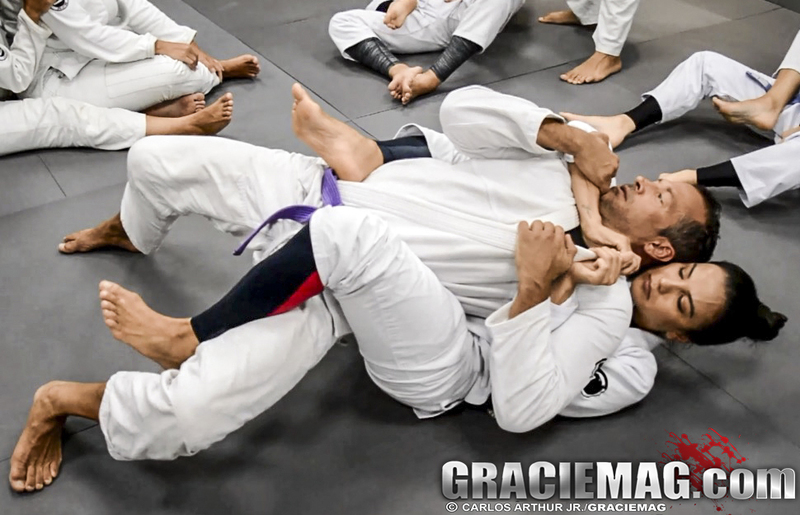 Carlos Arthur Jr.
Our partner school Gracie Kore, which has welcomed names like Robson Gracie, Roger Gracie and even Brazilian megastar Zeca Pagodinho, had last month a day of training featuring owner couple Kyra Gracie and Malvino Salvador testing out a few BJJ positions. The session, documented exclusively by the Graciemag team, took place during the seminar with Roger Gracie. The ten-time world champion taught details for choking from the back, and the disciplined student Malvino, a purple-belt actor who has appeared in telenovelas for the past 15 years, recruited Kyra to perform the move. With Roger’s tips, Malvino tried out the choke, and then it was Kyra’s turn to return the present, with her well-known pressure when attacking from the back.